In September, I published 51 Training Resources For Project Managers, one of the most popular articles on this website. To finish off this month’s series on conflict management, I thought I would present a similar list resources with a focus on conflict management resources. You will find resources across the spectrum here, so you can use this guide whether you are a novice or seeking advanced education. 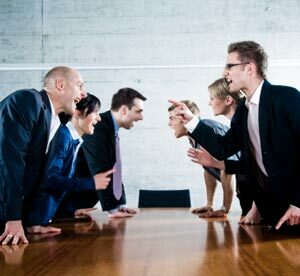 Remember – conflict is inevitable in projects and you are the manager! Books are an excellent way to start your educational journey of learning how to manage and respond to conflict situations. Consider the following titles to begin your studies in the topic. Note that I have not read these books. They are listed to provide a variety of perspectives on the topic. For some professionals, the “soft” nature of interpersonal skills is a turn-off. Shearouse’s books promises to help you solve conflict, handle negative emotions and get back to work. The right word at the right time can make all the difference. Take a look at this book if you are searching for ways to express your thoughts and feelings in conflict situations. At first glance, disagreements are frustrating in projects. You’re working hard to finish a complex change request or get agreement from a sponsor – disagreements are all around you. This new book shows how to understand and use power dynamics to your advantage. 5) Why great leaders don’t take yes for an answer: managing for conflict and consensus by Michael A Roberto (Second edition, 2013). Group think is a major problem in the corporate world (and in the public sector). If you are tired of easy answers, consider picking up this book. You will be reminded of the importance of conflict for testing assumptions and more. Mediators are called in to solve particularly challenging conflicts. If your project is facing a serious conflict, this handbook will provide an introduction on how mediators approach conflicts. If you are already working with a mediator (e.g. over a disputed contract), this book can help you to understand how a mediator would approach the situation. Similar to resource three, this book focuses on the importance of communication in conflict. Topics covered include responding to privacy related matters and offering criticism. I`ve read research suggesting that project managers spend over 50% of their time on communication so it pays to get better. 8) Difficult conversations: how to discuss what matters most by Douglas Stone, Sheila Heen and Bruce Patton. (10th anniversary edition, 2010). Based on the work of the Harvard Negotiation Project, this classic book is a staple of leadership and management courses. The book presents a model that can be applied to handling many types of conflict. The capability to handle difficult conversations will also improve your ability to negotiate. Mindfulness is becoming more and more popular as a way to manage stress and solve other problems. This book introduces the reader to common conflict management styles. This widely translated book has been become a standard textbook for handling conflict. The book emphasizes emotional intelligence and seeking good outcomes for everyone involved. Out of habit, many approach conflict as a zero-sum situation – this book points out a different path. As I quoted from this book heavily in my article Recovering From Project Conflict, it is no surprise to see Mersino’s book featured here. Improved emotional intelligence can help project managers to prevent conflict from occurring in the first place. Did you know that there are associations dedicated to the art of conflict resolution? As the world continues to grow more complex, conflict management and resolution organizations become more important. In terms of trends, many companies are now insisting on arbitration and mediation rather than the courts as they seek to lower the cost and time required to solve conflicts. Established in 2001 from a merger of other organizations, ACR is a membership organization for conflict professionals serving schools, families, companies and others. ACR offers four designation programs for those seeking further education. Project managers may wish to consider the Workplace Mediator AP Designation and the Workplace Labor and Employment Arbitrator AP Designation. 13) The International Association for Conflict Management (IACM). In contrast to ACR, IACM emphasizes research and publishing. The association’s primary activities include an annual conference, a newsletter and a journal. The website also provides a list of books by IACM members, an interesting mix of academic and traditional titles in several languages. 14) Canadian Institute for Conflict Resolution. Founded in 1988, the Institute offers training programs and best practices for resolving conflicts. The Institute also seeks to incorporate concepts from Canada’s First Nations: a reminder that there are many roads to resolving conflict. Intervention services offered include mediation, coaching and facilitation. 15) International Academy of Mediators. Established in 1996, the Academy is focused on mediation for disputes. If you are running a project and encounter serious problems with a multi-million dollar contact, mediation may be the solution. The Academy website also contains links to a variety of resources and books on mediation. Formal study of conflict management methods is an excellent way to enhance your leadership. A study of these techniques can also help you to recognize conflicts before they become serious. Read on to learn more about your options ranging from online courses to traditional courses. Tip: You can earn PMP PDUs through iTunesU for free in a variety of business and management topics. This eight week course is offered by the Mendoza College of Business at the University of Notre Dame. Topics covered include managing hostility, conflict styles and balancing assertiveness and empathy. At the time of publication, the course fee is $1980. This six course program offers a robust education in the theories and methods of conflict resolution. Offered by the Department of Law and Legal Studies, the Diploma has a legal perspective. To decide if this diploma is right for you, consult the course outlines for more detailed information about the diploma’s content. 18) York University Certificate in Dispute Resolution. As the certificate website points out, “the ability to understand and resolve conflict is now considered a “core competency” in many private and public sector workplaces.” This York University certificate has three required courses. The certificates instructors include experts in family law and workplace conflict management. Taught by Lisa Gates, this online video course covers the fundamental concepts of conflict resolution. The course provides examples and a six step process to resolving conflicts. Offered by one of California’s leading universities, the program covers ethics in the workplace, group dynamics and other concepts. At the time of this writing, the introductory course – Introduction to Meditation, Facilitation and Community Engagement – is available online and in the classroom. The approximate cost of the program is $3600 (varies depending on choice of electives). This multi-course program is delivered by Western University, based in London, Ontario, Canada. Elective courses include: Shifting from Positions to Interests, Communicating in Conflict, Asserting Yourself Under Pressure and Developing Your Emotional Intelligence. Several of the courses are offered online. 22) Justice Institute of British Columbia: Centre for Conflict Programs. Informed by law and meditation principles, the Centre offers seven distinct programs. Of various programs offered, the Associate Certificate in Workplace Conflict has the greatest relevance for project managers (approximate cost: $2400 Canadian dollars). This type of program is most appropriate for project managers operating in high risk sectors. This three course certificate offers a foundation in the conflict. Topics covered in the certificates include negotiation, information processing style, leading through conflict and advocacy skills. The program is delivered online exclusively. This program reaffirms the central importance of negotiation skills in conflict resolution. The program fee is approximately $5400. In contrast to the high price tags of other courses, this program is much more affordable with a $300 fee. This course is accredited with PMI and project managers can earn 3 PDUs (professional development units). Students will learn Dale Carnegie’s 12 methods to defuse an argument, how to identify anger triggers and other strategies. This two day intensive course is part of a leadership program offered at Dalhousie University in Halifax, Nova Scotia, Canada. The program covers best practices such as William Ury’s “getting past no” model, choosing when to intervene in conflict and understanding yourself. At the time of this writing, the course is not offered online. The final section of this article is a combination of various websites, companies and other materials to aid you in learning conflict management. You may never have the need to hire a mediator in your project work. Yet, “hire conflict mediator” could be added to your risk management plan for particularly challenging situations. Based in San Diego, the Center offers training and mediation services to families, communities and companies. The Center offers workshops, individual coaching and summer programs around the world. The Center website also has a database of two hundred neutral mediators that can be brought in to assist with conflicts and disputes. Published by the American Bar Association, Dispute Resolution Magazine is a resource for those who work on solving conflicts. Articles are welcome from both scholars and practitioners. Recent topics covered in the magazine include ADR systems, government regulators and global dispute resolution. Readers may purchase subscriptions through the website. Meredith Richardson brings a combination of legal training, wide ranging volunteer experience and conflict management techniques. The website includes articles on business mediation and other types of conflict management. Richardson can also be hired through the website. With eighteen episodes available, this podcast is a free introduction to the art of negotiation and managing conflict. Topics covered in past episodes include: how to negotiate your salary and how to tell someone you are unhappy with their work. 30) Mediation Podcasts and Speeches. Ever wanted to hear how the professionals do mediation? On this website, you can listen to lawyers and other mediation experts discuss their approaches in audio recordings. The International Mediation Institute provides other resources including a library of articles. Do you want the university experience without the heavy tuition fees? This online course from the Massachusetts Institute of Technology (MIT) could be perfect for you. The lecture notes include exercises and role playing scenarios to help you understand the material. Taught by several faculty members, this Saylor.org course covers negotiation planning, negotiation processes and conflict resolution. Successful completion of the course requires completing an assignment and a final exam. This online resource is a self-serve library covering numerous topics in conflict resolution. Beginners can start with the essays section to learn about key concepts such as zone of possible agreement (ZOPA), best alternative to a negotiated agreement (BATNA) and the psychological aspects of conflict. What resources have you used to develop your conflict management skills? How can you improve on your ability to manage conflicts?